Joan V. Lee – Age 87, wife of the late William R. Lee died Monday at her home surrounded by her family. She was born in Billerica, June 21, 1931, a daughter of the late H. Allen and Lillian (Taylor) Jenkins and lived in Billerica her entire life. Mrs. Lee graduated from Howe High School. 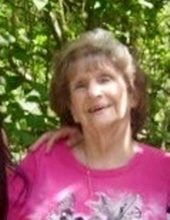 She is survived by her sons, Daniel, Michael, Steven, Kenneth, Joseph and John Lee all of Billerica, Timothy Lee of Bedford and William Lee of Hampton, NH; her daughter, Janet Lee of Hudson, NH; her sister, Joyce Swanson of Billerica and is also survived by 17 grandchildren and 13 great grandchildren. She was the mother of the late Robert Lee and Wendy Lee and sister of the late Allen, Warren and Edward Jenkins, Dorothy McDewell, Marie Carlson and Betty Vonderheide. LEE – of Billerica, Feb. 4, Joan V. (Jenkins) Lee, Visiting hours will be held Wednesday at the SWEENEY MEMORIAL FUNERAL HOME, 66 Concord Rd., Billerica from 4-7 p.m. A Funeral Service will be held Thursday at the Community Congregational Church, 803 Boston Rd., Billerica at 10 a.m. Relatives and friends respectfully invited. In lieu of flowers, memorial contributions may be made to the Alzheimer’s Association, 309 Waverly Oak Rd., Waltham, MA 02452. Burial in Fox Hill Cemetery, Billerica. "Email Address" would like to share the life celebration of Joan V. Lee. Click on the "link" to go to share a favorite memory or leave a condolence message for the family.